Can a Hospital Be Both Hygienic and Environmentally Sustainable? When it comes to hospitals we all expect the highest standard of cleanliness and yet, we want every part of our lives to be more sustainable. Of course, when hospitals are faced with a choice that puts hygiene up against sustainability, hygiene always wins. But I wonder if it’s possible to find ways for both to win? Increases in greenhouse gas emissions (GHGs) are causing serious environmental events and public health consequences, such as temperature-related illness and death due to extreme weather events, the spread of infectious disease vectors, increases in water borne illnesses, and wide-ranging impacts from air pollution. According to the World Health Organization (WHO), climate change is expected to cause approximately 250,000 additional deaths per year when we reach the years 2030 to 2050. The direct damage costs to health (excluding costs in health-determining sectors such as agriculture, water and sanitation), are estimated to be between US$ 2 to 4 billion/year by 2030. Reducing emissions of GHGs by improving how we handle wastes, transportation, food and energy-use choices, can result in improved health, particularly through reduced air pollution. Are Hospitals Mistreating the Environment? A UK report published by the Sustainable Development Unit (SDU) in January 2016, based on 2015 data, shows that the National Health Service (NHS) carbon footprint in England is 22.8 million tonnes of carbon dioxide equivalents (MtCO2e). The SDU states that between 2007 and 2015 the carbon footprint of the NHS has been reduced by 11%. Practice Greenhealth estimates that American hospitals create 25.1 pounds of waste per staffed bed in one day. This includes biohazardous, solid, recyclable and hazardous waste. 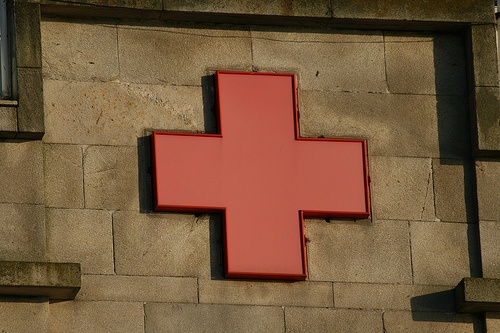 Considering that the healthcare sector will be on the front line of any climate-related disasters and, it is generally accepted that healthcare sees “do no harm” as one of its goals, focussing on sustainability in hospitals is coming to be seen as crucial. How to Deal with Medical Waste? The WHO estimates that about 85% of the total amount of waste generated by healthcare activities is general non-hazardous waste. That leaves a remaining 15% that is hazardous by being infectious, toxic or radioactive. Since the vast majority of hospital waste consists of disposable plastics and packaging, efforts to recycle clean sterile plastic waste need to be improved. Stainless steel vessels are useful in the fight to reduce waste, however, energy requirements for the initial creation and shipping of these items, plus auto-claving systems used to sterilize, must be considered in any analysis of what is best for the environment. Some equipment cannot take the heat of sterilization, in which cases, ethylene oxide, a known carcinogen, (used in making anti-freeze and polyester) is utilized, but alternate solutions are recommended by the EPA and hospitals are routinely faced with the question: is it better to sterilize, recycle or compost? You might wonder if it is even possible for composting to exist in medical settings. The answer is: yes. One example of a hospital with a successful composting program is Harborview Medical Center in Seattle (413 beds). It was named the 2012 Recycler of the Year for a medical facility and has taken steps to incorporate composting into its day-to-day routine. Children’s Hospital of Wisconsin (296 beds) produces about 102 tons of waste per month. In 2015, the hospital produced 2,448,000 pounds of waste and less than 3% of that waste was recycled. The Children’s Hospital Sustainability Committee has set a goal to recycle at least 15% in 2016 and says the best sustainable hospitals are recycling more than 50% of their waste. It is hard to overstate the value of a medical buyer who is aware of sustainability issues when making choices between vendors for large contracts. Environmentally Preferable Purchasing (EPP) is defined by the Canadian Coalition for Green Health Care as purchasing goods and services whose environmental impacts have been analyzed and determined to be less harmful to human health and the environment when compared to competing products and services. EPP is a system that aims to make purchasing decisions that eliminate unnecessary packaging, and finds substitutes for products containing mercury or other toxic substances. Products purchased by EPP are generally less toxic, minimally polluting, more energy efficient, safer and healthier for patients, workers, and the environment, higher in recycled content, packed in less packaging material, and fragrance-free. EPP often involves ideas such as buying in bulk, reprocessing single use devices and reusables. What are some of the new environmental products available for medical purchasers to buy? Companies like Vernacare are working to reduce the amounts of plastic waste that hospitals generate by producing compostable products. Compostable bed pans, urinals and bowls are all an improvement over disposable plastic items used for the same purpose. An interesting twist to looking for “new” environmental products in healthcare, is that many hospitals are turning to a very old solution: copper. The National Center for Biotechnology Information (NCBI) states that bacteria, yeasts, and viruses are rapidly killed on metallic copper surfaces. This process is called “contact killing.” Surfaces such as railings, door knobs, bathroom fixtures, call buttons and IV poles can all benefit from the anti-bacterial properties of copper. In fact, many hospitals across America are now installing copper components on “high-touch” surfaces easily contaminated with microbes, according to a recent Washington Post article. The savings related to reducing hospital acquired infections (HAIs) with small changes like mounting copper handles and railings are significant. How does this relate to sustainability? Consider the reduction in required chemicals to wipe down such surfaces and the decrease in use of disposable items to keep surfaces sanitary. Another sustainability challenge facing healthcare is finding sources of power that do not also serve to harm the health of the general public. In the province of Alberta, there are growing concerns around the health effects of coal-related air pollution. In 2014, 55% of Alberta’s electricity was produced from 18 coal-fired generators. In November 2015, the Government of Alberta announced a goal for zero emissions from coal-fired electricity generation by 2030. According to the Canadian Association of Physicians for the Environment (CAPE), this change is expected to produce air pollution-related health benefits worth approximately $300 million per year or $3 billion over 10 years. An example of how solar power can be used in a hospital setting can be found at Hôpital Universitaire de Mirebalais in Haiti. This Haitian hospital uses 100% solar power for its electricity with panels on the roof and sells any surplus power back to the grid, saving $379,000 in operating costs, with over 300 tons of CO2 emissions avoided (see SolrenView to find the latest data, updated every 15 minutes). In 2014, the British Medical Association committed to divesting from fossil fuels and The Royal Australasian College of Physicians followed suit in June 2015. Many hospitals are thinking beyond traditional sources of power. Just last month, Queen Elizabeth Hospital in King’s Lynn, England switched on a wind turbine to save approximately 600 tons of CO2 each year. One great resource for information on sustainability in healthcare settings is the Health Care Without Harm website. This is where hospitals and health centers can sign up to participate in the 2020 Healthcare Climate Challenge that has 3 main goals: reduce healthcare’s carbon footprint, prepare for impacts of extreme weather and educate staff and the public while promoting policies to protect public health from climate change. Seminars and conferences are another way for healthcare professionals to learn more. This year there are numerous opportunities to learn coming up, including the CleanMed 2016 Conference & Exposition: Redefining Health Care Sustainability, held in Dallas, Texas on May 17 – 19. CleanMed 2016 will cover such important topics as sustainability and employee engagement, greening the laboratory, biohazardous waste, water efficiency in healthcare, the pros and cons of antimicrobial hand soaps in relation to HAIs, food waste, smart purchasing, pharmaceutical waste and many more. Another upcoming healthcare sustainability conference is the Canadian Healthcare Engineering Society National Conference: "RISKY BUSINESS: Is Healthcare Sustainable?" which will be held September 11th to 13th 2016, at the Vancouver Convention Centre in British Columbia. Efforts to make hospitals more sustainable are translating into monetary savings, reductions in wastes and emissions, and, most importantly, positive health outcomes across the globe. Discussions on how hospitals can be more sustainable are really just beginning, but it is clear to see that when we put our brains together we can ensure hospitals work towards being both hygienic and sustainable.